Abby Morgan (right), a NHTSA safety standards engineer, sits with Eugene Peterson, tire program manager at the Consumer Reports Auto Test Center. 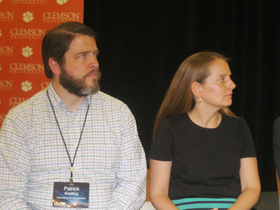 From left, Patrick Keating, senior manager-technical engineering for Yokohama Tire Corp,. 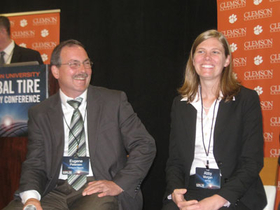 sits with Tracey Norberg, RMA senior vice.president and general counsel, at the Clemson Tire Industry Conference.